The potter’s craft is as old as the hills. People discovered plastic properties of a clay thousand years before Christ and they valued its utility immediately. When – by accident - the first earthenware fell into a bonfire, people are making ceramic utensils until nowadays and produced them industrially. Clay, apparently not interesting material, but grateful and easy to shape, allowed us to create the items ourselves according to our imagination and ability. 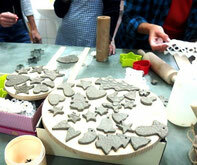 On Thursday workshops we learned the most important and simplest skills, like the roll of clay patches and the formation of rollers and then with great enthusiasm we cut out birds and Christmas trees and many others different ornaments. We left them to dry and to fire. Ready items we will get next week. On our traditional autumn picnic we went to Hucisko where our club’s sister lived in a nice manor house. The origins of this manor house go back to 18th century. Emanuel Lipowski built it in 1815-1817. The house was inherited by the successive heirs of the family. After the WWII the manor house was one of twenty eight in Poland still in the hands of rightful owners. After the death of the last one in 2004 the equipment of the house was divided between the members of the family but the house was abandoned and fell into ruin. Its magnificence was restored by new owners Agnieszka and Piotr Rozwadowski. 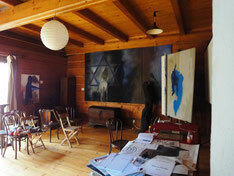 The other attraction of the picnic was a visit to Tadeusz Kantor’s house situated near the manor of our friends. Tadeusz Kantor (1915-1990) was an outstanding artist – painter, graphic designer, theatre director and stage designer, art theoretician and reformer of 20th century theatre. But first of all he was world-famous creator of Cricot 2 Theatre (Cracow 1955). His house in Hucisko from the very beginning was supposed to become future museum of both him and his wife’s Maria Stangret-Kantor (a painter as well) art. The house was designed by Kantor and even its construction was supervised by the artist himself which is its additional value at present. Nowadays the house is squalid and lost its beauty which exuded in the artist’s time. This house was the only Kantor’s architectural realisation. 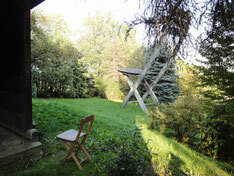 Close to the house there is an original concrete fourteen-metres high sculpture of ‘The Chair’ by Kantor. It is third his realisation of this kind. At the turn of sixtieth and seventieth of previous century Kantor was creating the idea of ‘Impossible Monument’ which were huge concrete chairs put somewhere in an open space. Before he successfully realised two of them: in Vela Luka (1968) in former Yougoslavia (nowadays Croatia) and in Oslo (1971) in Norwegia. We recognized both huge bulb project and a bridge over Vistula river in a form of gigantic hanger to be a part of those ‘Impossible Monuments’ as well. ‘The Chair’ in Hucisko was built by Tadeusz Kantor’s Foundation in 1995. 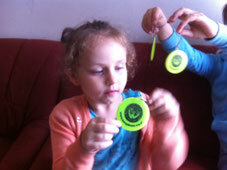 The aim of this project is to educate people, women and girls in particular that they have to wear reflecting badges when walking along the roads at night. The project initiated by The First SI Krakow Club is going to distribute the pvc hangers with Soroptimists logo glowing in a dark – a thing to be attached to a handbag, knapsack, and buttonhole.